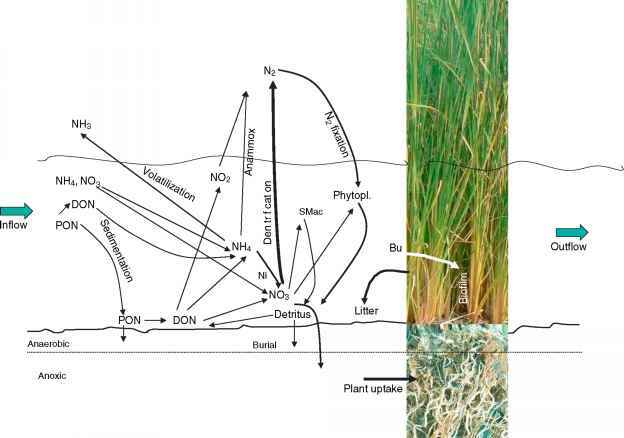 Constructed wetlands (CWs) with subsurface flow can be catagorized into horizontal subsurface flow (HSSF), vertical flow (VF), and hybrid CWs (see Constructed Wetlands, Surface Flow for detailed classification of CWs). The hybrid CWs mostly consist of a combination of HSSF and VF CWs but, in general, any types of CWs can be combined in order to enhance the overall treatment performance. This section, however, will discuss only subsurface flow CWs. The concept of both HSSF and VF CWs was devel oped in the 1960s by Kathe Seidel in Germany. Before that, between 1952 and 1956, Seidel carried out numerous experiments on the use of wetland plants for treatment of various types of wastewater, including phenol, dairy or livestock wastewater. In early 1960s, Seidel intensified her trials to grow macrophytes in wastewater and sludge of different origin and she tried to improve the performance of rural and decentralized wastewater treatment which was either septic tanks or pond systems with inefficient treatment. She planted macrophytes into the shallow embankment of tray like ditches and created artificial trays and ditches grown with macrophytes. Seidel named this early system the hydrobotanical method. Then she improved her hydrobotanical system by using sandy soils with high hydraulic conductivity in sealed module type basins planted with various macrophyte species. To overcome the anaerobic septic tank systems she integrated a stage of primary sludge filtration in vertically percolated sandy soils planted with Phragmites australis. So the system consisted of an 'infiltration bed' through which the sewage flowed vertically and an 'elim ination bed' with a horizontal flow (HF). This system was the basis for hybrid systems which were revived at the end of the twentieth century.